Victoria Trott is a freelance travel writer who specializes in European travel, especially within France. A former resident of the Côte d’Azur, she is co-author of Frommer’s Provence & the Côte d’Azur with your Family and has updated many guidebooks on the region. 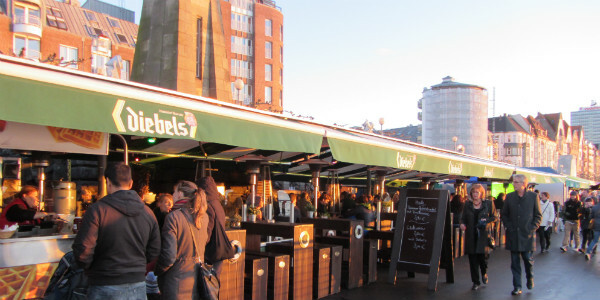 In her latest article below, Victoria shares why travelers should consider visiting Düsseldorf. It might only be the seventh largest city in Germany, but Düsseldorf, the capital of North Rhine-Westphalia, is certainly one of the country’s most happening destinations. As well as being a major center for business, fashion and trade shows, Düsseldorf is culturally rich with a wide variety of world-class art galleries, museums, theaters and music venues. In fact, the city has a long association with the world of music starting with the 19th-century composers Schumann and Mendelssohn to hosting the Eurovision Song Contest in 2011. Boosting its reputation even further, Düsseldorf was voted the sixth best place in the world to live in the 2010 Mercer Quality of Living Survey. 1. It’s easy to get to. Düsseldorf International Airport is just an hour’s flying time from London, or you can take the train from London St Pancras in around five hours – a standard return fare with Deutsche Bahn (German Railways) starts at €98. 2. It’s eventful. Like all major cities, Düsseldorf has a year-round events calendar. Highlights include the Rhine’s biggest funfair in July, the carnival season from November to February and the magical Christmas market in November and December. 3. The Rhine. 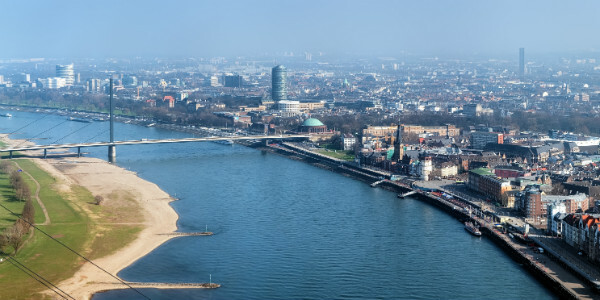 Rising in the Swiss Alps and entering the North Sea in the Netherlands, the Rhine is one of Europe’s longest and most important waterways and also happens to run through Düsseldorf. Enjoy a stroll along the Rhine Promenade or take a boat trip to the MedienHafen (Media Harbor), the renovated old harbor that now houses many arts and media companies and is the city’s most fashionable area for going out. Back on dry land, head to the Schifffahrt Museum, which traces the history of shipping on the Rhine. 5. The shopping. Köningsallee, known locally as the Kö, is one of the glitziest shopping streets in Europe, where you’ll find boutiques from some of the world’s top designers; up-and-coming labels can be found in the Flingern district. Art and antique lovers should head to Carlstadt, noted for its lovely 18th– and 19th-century buildings and also for its fruit and vegetable market. Local specialties include mustard and the herbal liqueur Killepitsch. 6. The art. If you don’t have time to visit all of Düsseldorf’s 26 museums and 100+ galleries, head to the Museum Kunstpalast. There you’ll find works by Gerhard Richter (one of the world’s most successful artists who used to teach at the city’s influential Arts Academy), the Düsseldorf School of Painting and Expressionism and several works by Peter Paul Rubens that were collected by Jan Wellem, who ruled the city in the 17th century. 7. The music. As well as being the home of electro-pop pioneers Kraftwerk (whose founders studied at the Arts Academy), Düsseldorf was the birthplace of the punk movement in Germany and also what is alleged to be Europe’s first disco, Cream Cheese. You can find out more about Düsseldorf’s musical history on the “We love music” tour offered by RhineBuzz. The city is home to one of Germany’s (and the world’s) best opera companies, Oper am Rhein, and also to a truly stunning domed venue, Tonhalle, which was built in 1926 as a planetarium and is now noted for its excellent acoustics. 8. The food. When it comes to food, Germany isn’t France but it doesn’t mean you can’t eat well. For a gourmet experience try Monkey’s West where minimalist meals created by Germany’s Chef of the Year 2009 and 2011 are served in arty surroundings. For traditional dishes such as bratwurst and fried potatoes or pickled herring with red cabbage and potato dumplings, head to the brewery Zum Schlüssel. The most fashionable area to eat out in is the MedienHafen – try quirky Shabby Chic, where the menu is as eclectic as the surroundings. 9. The architecture. The highlight of Düsseldorf’s architectural history is without doubt the Rheinhafen in the MedienHafen area – three buildings with slanting, curving forms that were designed by Frank O. Gehry in the 1990s; nearby is the award-winning, energy-efficient Stadttor (city gate), which consists of two rhombic glass towers and is home to the State Chancellery. Also of note is the Ehrenhof whose angular, austere Expressionist lines were built in the 1920s for a trade fair and which now house the Museum Kunstpalast. 10. The skiing. Eleven kilometers (7 miles) west of Düsseldorf in Neuss is Germany’s first snowdome, the Jever Skihalle, which offers an “authentic” Alpine experience in the urban heartland. As well as a 330-meter-long slope, a terrain park, a toboggan run and Alpine restaurants, there’s an onsite four-star hotel and spa so you can make a weekend of it. The Düsseldorf WelcomeCard starts at €9 for 24 hours and gives either free or reduced entry into museums and other sights as well as free use of the excellent public transport system. You can buy it from the tourist information office at the train station or in the Old Town. If you’ve got a head for heights, take the lift to the top of the Rhine Tower (174.5 m/572.5 ft) – home of the world’s tallest digital clock – for panoramic views across the city and the river. For more on Vitoria’s travels visit VictoriaTrott.com or follow her on Twitter @trottaround.